A multi award winning radio documentary - "The Runners" is the name given by Christian Brothers to children who escaped from Industrial schools. 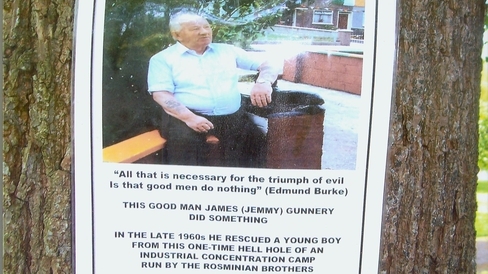 “The Runners” – is about Jemmy Gunnery – a Dublin man who helped break children out of and escape from state industrial schools during the 1960s. Imagine you are twelve year old boy. You have been sent to Ferry house industrial school in Clonmel, Tipperary for seven years for robbing rosary beads from a factory. You are miles from home. As detailed in the Ryan Report and by Michael O’Brien – sexual and physical abuse was endemic and systematic in the Industrial school. Imagine somebody helping you escape. This documentary tells the story of story of Christy Fagan – a child sent to Ferryhouse Industrial School and the man - Jemmy Gunnery - who helped him escape. Christy Fagan had been previously sent to Artane and LetterFrack where he constantly attempted escape. In the late 1960’s he was sent to Ferryhouse Industrial school in Clonmel. For Christy – being a runner was not simply just about escaping – it was about, despite the systematic abuse that reigned in these institutions, about never giving up - never letting the authorities break you down. Jemmy Gunnery was a docker who lived in the corporation flats in Dublin. Neighbours would say he kept to himself. He was a neighbour of Christy's. The story goes that the day Christy was sentenced – his mother – a widow was very upset. Neighbours were in her flat and Jemmy strode into the room. He promised Christy’s mother that he would free Christy. This documentary tells the story of how Jemmy Gunnery helped Christy’s escape. It’s also believed that Christy is not the only child that Jemmy helped escape – leading to Jemmy being nicknamed ‘The Northside Oscar Schindler’.